To venture out into the severest storm to rescue stricken ships and helpless sailors was both the final heroic act and all in a day’s work for Captain Boyd and his brave men. John McNeill Boyd was born in Derry in 1812. He joined the Royal Navy at the age of 13 and worked his way up through the ranks to become a captain. In 1858 he became captain of the HMS Ajax and commander of the Dublin District of the Irish Coast Guard. Boyd will be forever remembered a hero for his acts of bravery when he and members of his crew lost their lives trying to save two ill-fated vessels off Dun Laoghaire Harbour. 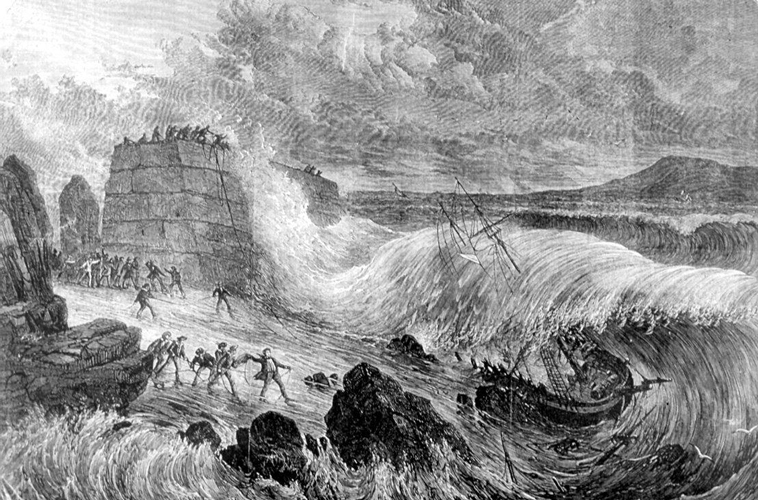 One of the most severe storms ever recorded raged on the east coast of Ireland on the weekend of 8th and 9th February 1861. Throughout the weekend numerous ships faced the severe gales and were battered and lost to the sea. On Saturday the 9th the Neptune and the Industry sought the shelter of Kingstown harbour (now Dun Laoghaire). They attempted to enter the harbour but got caught in the waves and were smashed against the rocks at the back of the east pier. Captain Boyd’s guard ship Ajax was stationed in Kingstown. When he got word of the disaster he summoned his men into action ordering a boat to be manned to rescue the crew of the fallen vessels. His men lashed themselves together with ropes and edged down the rocky slope in an attempt to save those struggling to swim ashore. As the heroic Captain alongside his brave crew desperately tried to aid and rescue them, an enormous wave surged over and swept them away. Boyd and five of his crew, Thomas Murphy, John Curry, John Russell, James Johnson, Alexander Forsyth were drowned. The bodies of the crew washed ashore a few days later and were buried in Carrickbrennan graveyard in Monkstown. Boyd’s body was not recovered for a few weeks. He was buried with full Naval and Military honours in the graveyard of St Patrick’s Cathedral in one of the largest most splendid funerals ever seen in Dublin. He was awarded posthumously with the RNLI Silver Medal, the Tayleur Gold Medal and the Sea Gallantry Medal. Boyd’s eternally loyal dog, a Newfoundland, followed his master to his final resting place. He was with the rescue crew when they recovered Boyd’s body and when the captain was buried the dog lay down on the grave and refused to leave. Eventually, he starved, dying next to his master. Heroic sailor! From that fatal sea. The life not lost but found beneath the wave. In Carrickbrennan Graveyard, Monkstown there is a sculpture dedicated to the crew. Others are located in Cheltenham, Derry and Portsmouth. 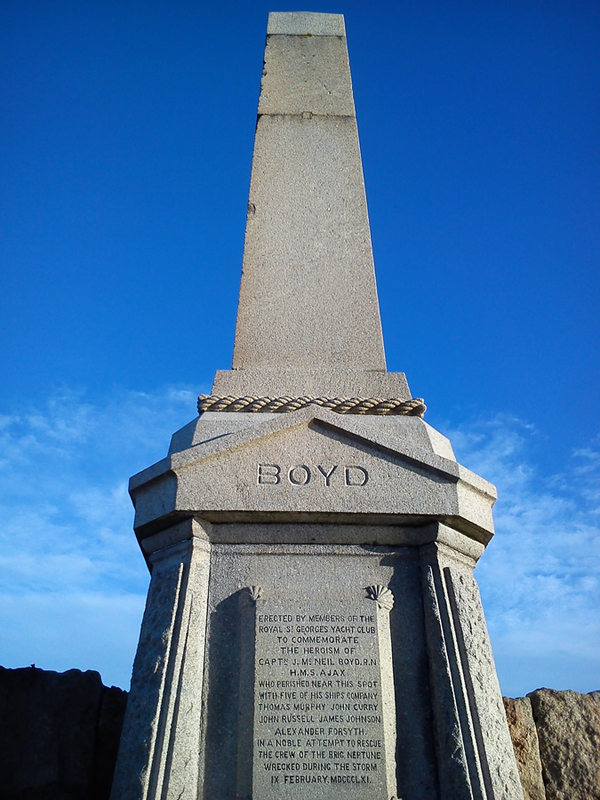 Captain’s Boyd’s and his men’s brave deeds, this and the many previous, make them true Irish maritime heroes.